Eco-conscious homeowners are ever on the lookout for new technologies that will help reduce our use of resources and the bidet has proven to be a valuable home addition that achieves just that. Do you know that in the United States alone, people use an estimated 36.5 billion rolls of toilet paper annually? That means over 15 million trees cut down from forests, 473 billion gallons of water used up during manufacturing, 17 terawatts of electricity powering the toilet paper factories and 253,000 tons of chlorine employed for bleaching the pulp. Now, imagine how much resources are wasted for toilet paper production worldwide. If you’re at all concerned about reducing your household’s environmental footprint, the bidet is an easy way to achieve it, single-handedly eliminating the need for toilet papers in the bathroom. 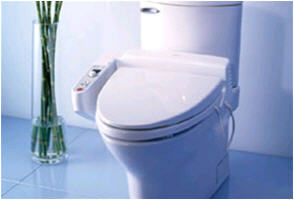 A single toilet seat bidet (you can find decent quality, non-electric ones for as low as $50) can be attached to your existing toilet and plugged into your plumbing with just a short amount of work. If you hire a contractor to install it, the whole job should cost you no more than $150. Using only water to clean you up after doing the dirty deed, it uses very little resources for essentially the same function as toilet papers. Apart from the cleaning, some bidets even include a drying mechanism so you really don’t need any toilet paper to wipe your posterior dry. Alternatively, many green-conscious bidet users keep bidet towels to pat themselves dry instead of toilet papers to totally eliminating the pulp product from their bathrooms. If you’re really earnest about saving those rainforests, you may want to get serious about installing a bidet. It really will help you achieve those conservation goals faster than ever before, as well as hold off on the use of plenty of resources in the process.